Here is some great Brick By Brick news from the City of Angels. Archbp. Gomez official set up a traditional parish, staffed by the FSSP, exclusively for the traditional Roman Rite. Fr. James Fryar, a fine priest whom I met in NYC, is the pastor. 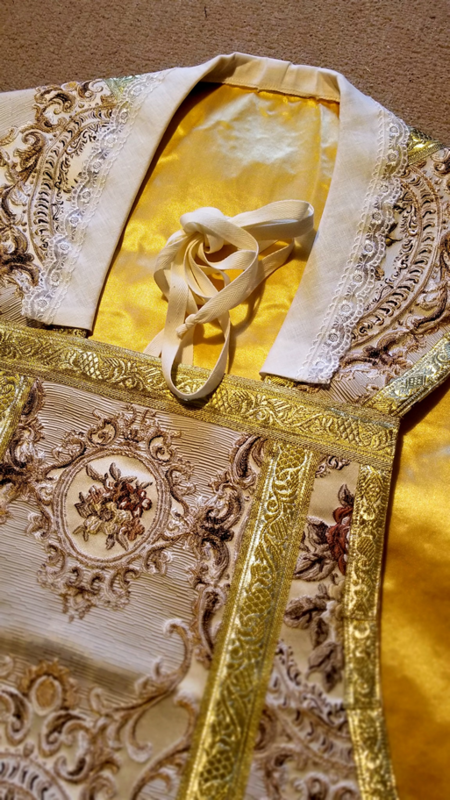 An interesting note: A parishioner made the vestments. Great photos of their building project. Really interesting. This entry was posted in "How To..." - Practical Notes, Brick by Brick, New Evangelization, Our Catholic Identity and tagged Archd. Los Angeles, FSSP. Bookmark the permalink. Archbp. Gomez is a great man. Another good pariah in the Los Angeles area is St. Peter Chanel in Hawaiian Gardens. It is staffed by the Oblates of the Virgin Mary, has frequent confessions, solid preaching, reverent Mass, and no altar girls. I have also heard that there is a parish in Alhambra that celebrates a more traditional Mass. YES HE DID! That makes it the 3rd regularly offered EF Mass in the smallest state. I never cease to thank God for our good shepherd in Providence. Yes, St. Therese in Alhambra has the traditional Mass in Latin every Sunday at 1:00 PM. Right you are, Clinton R. It was the site of the recent FSSP sponsored sacred music symposium. A week of glorious music. Culminating in this https://www.youtube.com/watch?v=tNA6Z8mXmYw. Lovely. If my experience in Phoenix is any indication, this parish will quickly outgrow its smallish worship space and, should the homilist have a solid grasp of Spanish, the 5pm Mass will be especially well attended.